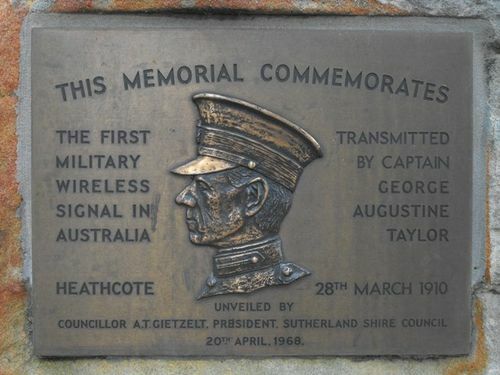 Memorial to the first military wireless signal transmitted at Heathcote by Captain George Taylor. On March 11 1910, a meeting in Hotel Australia, Sydney, decided to form "The Wireless Institute of Australia". The chairman of that meeting was Lieutenant (later Major) George Augustine Taylor. Two weeks later he transmitted the first military wireless signal in Australia. The Morse Code signal was received at a second military camp several kilometres distant. This was pioneering work of the day and showed that such signals could be transmitted under less than favourable conditions and from rugged terrain, ultimately proving to be of great assistance during the Great War of 1914 - 1918. There is evidence that Captain George Augustin Taylor did not transmit the message but that the message was transmitted by three civilians Messrs Kirkby, Hannam and Wilkinson who brought all their own equipment with them. Two sites were established to conduct the tests from a station A and a station B. Station A was in a tent adjacent to the gatekeepers cottage at Heathcote Station. Station B was 2 miles to the south in a cave on a landmark Spion Kop in what is now Heathcote National Park. The experiments were successful and Taylor gave all credit to the civilian experts. The story of the civilian's involvement in the experiment is told in an article by Lieutenant George A Taylor Army Intelligence Corp By Wireless - How We Got The Signals Through cc 1910. The First Military Wireless Signal in Australia.